A: Hello. Port Elysium News is delighted to be a sponsor of the Finale Avi Choice Awards. 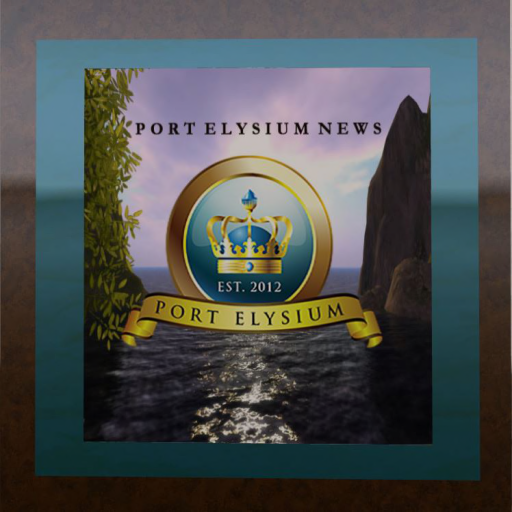 I’m Elicea Igaly, Founder, Publisher and Editor of Port Elysium News. A: I landed in Azure Islands Welcome Area in the early A.M. hours, EST U.S. on July 28, 2007; but I didn’t start “living” in SL until 2009, after I finished my B.A. degree and got a more powerful computer (smiles). My first residence and friendships were established in SL New England. What brought me here? Intellectual curiosity and an inner calling, I believe, to move to an edge in life—to slip out of the mundane middle of life. I was always inclined toward belief in science fiction ideas of advanced human life. I came into SL that morning after reading an article in The Atlantic Monthly magazine the evening before, while I was in the offices of the law firm where I work. I was instantly fascinated, so I jumped. I have never regretted it! A: I’ve spent a lot of time decorating, landscaping, and of course, buying and styling clothes, developing my shadow self, I guess, one might say. As an adolescent in physical life, I was completely immersed in playing with doll houses, paper dolls and little-girl dolls, like Barbie, and sewing clothes for my dolls and myself. I also regularly read comic books about teenage girls “model” lives; but what I’ve learned along the way here in SL has been even more profound than all the play experiences of my youth. Not only have I learned technology skills I could never have learned in my real life livelihood, I’ve tapped a deeper part of me that would never have been possible in years and years of real life work, personal, social and family experiences. I’ve experienced a comprehensively deep and long-lasting behavior change that has dramatically enhanced my self-esteem and professional performance. In reality, I have learned how to learn to harmonize my rational and intuitive faculties. A: Port Elysium News (PEN) is a digital newspaper—Free Fall Diversions for Creative Class Minds. It’s a daily online publication with evolving derivative sites that together seek to promote interest in the craftsmanship sphere of Second Life to various audiences. PEN is at http://portelysiumnews.com, Twitter, four affiliated sites, most recently, Facebook. The online daily newspaper began publishing in 2015. Port Elysium, as a band name, was established in 2012. I, Elicea Igaly am the founder, publisher and editor. There is no other staff, at the moment. I recently set-up an inworld meeting place—Port Elysium News Chat Space, Berry Rue, 118, 98, 48. PEN seeks out the best of the best in fashion, architecture, interior design, the visual arts, including scripting and videography. We then distribute those visual voices and perspectives to audiences both outside of Second Life and within Second Life. Increasingly PEN moves to assist in encouraging, promoting and marketing the inworld for-profit businesses of content creators who practice craftsmanship. All in all, we like to move audience buying and entertainment preferences toward higher quality realism in SL virtual world content creation and visual performances. A: The SL charity I am sincerely passionate about and seek to support is the Team Diabetes of Second Life, an official affiliate of the American Diabetes Association (http://www.teamdiabetesofsecondlife.org/home.htm)l. In SL, the charity is organized and spearheaded by Johannes1977 Resident, founder and CEO of Kultivate Magazine. I believe Diabetes is perhaps the most pervasive and widespread chronic disease on the planet. I believe it is so common that every person we each know, knows someone who is suffering from diabetes. Someone is not living with full vitality and yet not terminally ill. But, diabetes is a killer. Increasingly children are being born with diabetes—sentenced from an early age to a daily life of prescription medications and self-administered insulin injections. I believe it’s awful and it’s preventable. A: My personal life outside of SL is not separate from SL, but by real life livelihood is quite separate. I still work in a law practice, so in reality, I definitely live two work lives. But in a personal inner-sense, I inhabit parallel lives—rationally and intuitively. Each day, more and more, I’m fortunate to be able to flow back and forth and apply in my physical life, what I experience and learn through aloneness and human social interactions in virtual life. Real life family that I have, as with most people outside of my virtual world life, are unable to support my aspirations. And that’s okay with me. Because I believe right now, even more so than when I first began to “live” in SL, that a person must to be “called” to come here. If a person was not “called” to be here, they will never relate to SL—never. I thank God every day for being able to be here….I have no regrets and I have greater inner strength about my aspirations. A: I value the idea of having associations of trust with different souls from different parts of the globe all interacting in SL. That to me is THE Big Idea. I’ve had and have six high-value friendships that originated in Second Life—male and female. I value each of them, because at the time each of them reached out to me in this ether space, each one did so with sincerity to meet and fulfill real, psychic, and emotional needs. I love and will always value them all for their unique support. In general, I truly think the most full-spectrum content creator in the fashion sphere that I’ve met in SL to-date is Thalia Heckroth. And finally if there are two people, who are not really friends, but whom I believe should always be given credit for what they did when they did what they did and contributed to in SL. They were huge milestones in my SL immersion. They are Topaz Joubert and Frolic Mills.